Pompeo had the gall to threaten US allies who have themselves been targeted by US Deep State aggression. This is never mentioned in their domestic political campaigns, but emerges after they take the reigns of power. Once they have served the Deep State in office, they have a home for the rest of their lives serving their interests. John Bolton is a prime example. After the first shocking statement below, I thought the rest of the article would be filler, but he got carried away with the moment, obviously relishing in playing Mr. Tough Guy. I can’t wait to see corporate media roll over on this. US Secretary of State Mike Pompeo has targeted Russia, China and Iran for opposing Washington’s “leadership role”. Pompeo said on Tuesday during a visit to Brussels ahead of a NATO foreign ministers meeting that President Donald Trump aimed to take the helm of a new world order, but certain “bad actors” were opposing him. “President Trump … is returning the United States to its traditional central leadership role in the world,” he said. Pompeo urged US allies to help Trump to succeed. “We are rallying the noble nations of the world to build a new liberal order” led by Trump, Pompeo said ahead of the meeting with NATO foreign ministers. 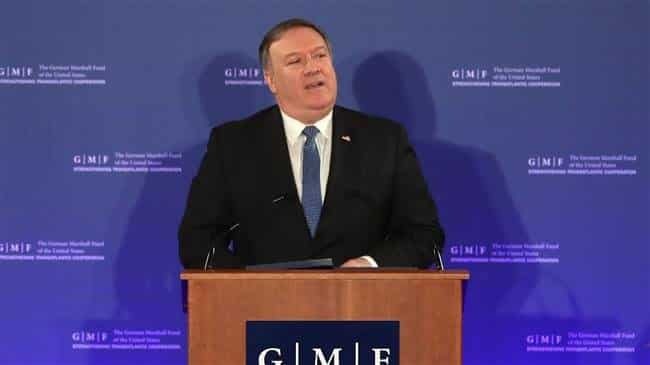 Pompeo claimed Russia, China and Iran had undermined the global leadership of the United States. He said the Trump administration would no longer tolerate opposing influences willing to stop it from reaching its objectives. The former CIA chief warned international organization to follow suit with US foreign policy. Pompeo hinted that international organizations had to either work in line with US foreign policy, or face change. Organizations such as the United Nations, European Union, African Union, the International Monetary Fund and World Bank have become corroded are in dire need of change, he suggested. Pompeo’s comments came as NATO foreign ministers are scheduled to meet to discuss recent escalating tensions with Russia.